This superb detached village property is within a short walk of a well kept village with Doctor's Surgery, School, Bar/Restaurant, Supermarket, Pharmacy, Bakery and Hairdressers. The property has been re-constructed from a ruin and where the walls have been rebuilt in block they have been stone faced. The current owner has had new doors and windows installed throughout the property and replaced the roof structure and tiles. Now over to a new owner for finishing! Viewing is highly recommended to appreciate the potential of this property. 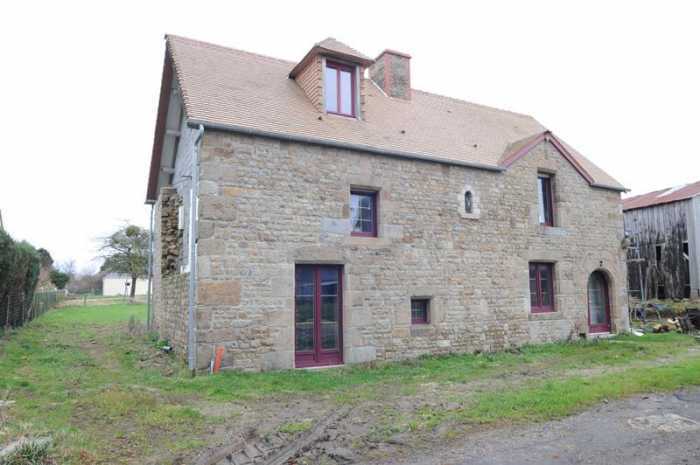 This property is situated in the south of the department of Calvados. The 18 hole golf course is within a few minutes drive at 7 km from the house and the dominial forest at Saint-Sever-Calvados is 8 km distant. The property is a 5 minute drive from the town of Vire, with all facilities including a train service to Paris (2 hours 45 minutes) and about an hour’s drive south from the port of Ouistreham, Caen , the landing beaches and an hour inland from the breathtaking bay of the Mont St Michel to the west. Living Room 6.39 x 6.28m Glazed door and side panel and window to front and window to east elevations. Part glazed door and 2 windows to rear elevation. Exposed stone walls. Granite fireplace with raised hearth. Stairs to first floor. Room (to finish) 5.49 x 4.31m Window and glazed double doors to front elevation. Access has been left to reach the first floor. Room 5.47 x 1.85m (ideal to convert to utility room) Window to rear elevation. Exposed stone walls. Bedroom 1 6.34 x 5.53m Windows to the front and rear elevations. (May be possible to include second floor - 2 dormer windows have already been fitted). Bedroom 2 6.39 x 6.28m Window to front, rear and east elevations. Exposed chimney breast. There is parking for 2 or 3 cars in front of the house on the opposite side of the lane. The garden itself is predominantly to the rear of the property, laid to lawn and partially fenced. Mains drainage, water and temporary electricity supply are connected. Broadband internet connection available.